Space shuttle Discovery rests on Launch Pad 39A after a seven-hour rollout from the Vehicle Assembly Building at NASA's Kennedy Space Center in Florida on Jan. 14, 2009. 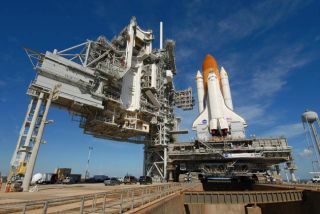 The shuttle is slated to launch no earlier March 12. Thisstory was updated at 10:00 p.m. EST. NASAmission managers delayed the planned February launch of the space shuttleDiscovery for the third time late Friday, with liftoff now slated for no earlierthan Feb. 27 pending the completion of ongoing fuel valve tests. Missionmanagers will review Discovery?s launch readiness during a planned Feb. 20meeting to determine if the shuttle is prepared to fly atwo-week construction flight to the International Space Station by Feb. 27.If so, the shuttle would be primed for a 1:32 a.m. EST (0632 GMT) liftoff onlaunch day, NASA officials said. The newdelay will give engineers more time to complete a series of impact tests onshuttle fuel control valves at several NASA centers across the country, agencyofficials said. NASA announced the new launch delay after a day-long review onFriday to discuss the ongoing tests. ?As you canexpect, with any issue of this complexity, there?s a tremendous amount of datathat?s being collected,? said Kyle Herring, a NASA spokesperson at the JohnsonSpace Center in Houston. ?In fact, data was coming in from testing during themeeting.? Discoverywas initially slatedto launch on Feb. 12, but last week mission managers delayed the launch byone week, then again to noearlier than Feb. 22, to allow engineers extra time to evaluate theshuttle?s fuel control valves. There arethree fuel control valves on a space shuttle - one for each main engine. Theyare designed to pop up much like a lawn sprinkler head to route gaseoushydrogen fuel through a set of plumbing lines and into a hydrogen reservoirinside the orbiter?s attached 15-story external tank. The valves ensure ashuttle?s hydrogen tank maintains the proper pressure during the 8 1/2-minutelaunch into space. During theNovember launch of the shuttle Endeavour, engineers found that a chip from oneof the metal valves broke free and flew into the plumbing lines leading to theexternal tank. The incident did not hinder Endeavour?s launch, which reachedorbit successfully. But NASAengineers want to be sure that a similar event, if it occurred duringDiscovery?s launch, would not puncture the shuttle?s vital plumbing lines andcause catastrophic damage. NASAengineers have been working long hours for the last three weeks to performhigh-fidelity impact tests using shuttle equipment. NASA?s space shuttleprogram manager John Shannon wanted to give them more time to analyze the databefore discussing an official launch target during the flight readiness reviewmeeting on Feb. 20, Herring said. ?Theywanted a little more time between the [flight readiness review] and the launchdate to close out, if they need to, any open items,? Herring said. Commandedby veteran spaceflyer Lee Archambault, Discovery?s seven STS-119 astronautsplan to swap out one member of the space station?s crew and deliver the finalset of U.S. solar arrays to boost the orbiting lab?s power grid during theirmission. Four spacewalks are planned for the spaceflight. Discoveryhas until March 12 to launch toward the space station and begin its 14-dayconstruction flight. If the shuttle is unable to fly by then, NASA would standdown until after a Russian Soyuz spacecraft launches a new crew to the stationaround March 26, Herring said. EarlierFriday, astronauts aboardthe International Space Station said that while they were looking forwardto the arrival of Discovery?s crew, they were more than willing to wait untilmission managers decide it was safe for the shuttle fly. ?We havecomplete confidence that they?ll make the right decision on flight rationalebased on solid data,? space station commander Michael Fincke of NASA radioeddown to Mission Control at NASA?s Johnson Space Center in Houston. Discovery?sdelay means a longer stay in space for NASA astronaut Sandra Magnus, a stationflight engineer who has lived aboard the orbital outpost since last November. Magnus isdue to return to Earth aboard Discovery after nearly four months in space. Herreplacement, Japanese astronaut Koichi Wakata, will arrive aboard the NASAshuttle to join the station?s Expedition 18 crew, then stay on to serve withthe next crew - Expedition 19 - when it arrives in late March. Wakata, aveteran spaceflyer, is Japan?s first long-duration astronaut. He is due toreturn to Earth aboard another NASA space shuttle later this summer. Discovery?sSTS-119 mission is NASA?s first of up to six scheduled shuttle flights of 2009.The other missions include several space station construction flights and thefinal overhaul of the Hubble Space Telescope. Theshuttle?s delay is not expected to affect the planned May 12 shuttle launchtoward the Hubble Space Telescope and a subsequent space station constructionflight, NASA officials said.